Paul “Louie” L. Foos, 79, of Clyde, OH passed away at home surrounded by his family on Tuesday, October 2, 2018. He was born June 18, 1939 in Fremont to Paul H. and Marie (Laurendeau) Foos. 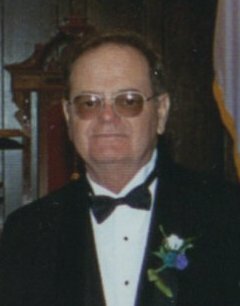 He was a 1957 graduate of St. Joseph Catholic High School and attended Tiffin University. Louie served in the U.S. Army Reserves. He worked for American Electric Power (AEP) as a meter reader for over thirty years and retired in 2001. Louie then worked as a bartender at various local bars including Stiney’s Three Oaks in Tiffin, OH. Louie was a member and Past President of the Eagles #402, a member of the DAV and AMVETS, all in Tiffin, OH. He was an avid dirt track and NASCAR fan, especially Terry LaBonte. He was also an avid bowler and loved spending time with his family. He loved his dog, Rocky. Louie is survived by his daughters, Angela (Ray Inman) Burroughs and Heather Foos both of Clyde, OH; grandchildren, Shelby Morton, Haley Burroughs, Justice Slane, Damon and Austin Prenzlin, Caitlin Foos and Levi Warwick; great granddaughter, Nevaeh Slane; siblings, Robert Foos, Connie (Dan) Coleman and Linda Dickman, all of Fremont, OH; former wife, Debra Foos, Tiffin, OH. He was preceded in death by his parents and infant daughter, Michelle Foos. Visitation: Monday, October 8, 2018 from 4 to 8 p.m. at Wonderly Horvath Hanes Funeral Home and Crematory, 425 E State St., Fremont, OH. Service: Tuesday, October 9, 2018: 11:00 a.m. at the funeral home with an hour of visitation prior to the service. Memorials: Hospice of ProMedica Memorial Hospital, American Diabetes Foundation, Wounded Warriors, SJCC or Donor’s Choice. My prayers are with you and your family. It must be really hard to go through the passing of a brother. You have a very caring family, and your family will be there for you. God bless. Your friend, Jenny Rose. So sorry to hear about the loss of your brother. I’m sure he will be missed by all who knew him. I will pray for the Foos family. I worked with Louie for 20 years and saw him often at the Eagles. He was funny, sarcastic, and always nice to me. Its been another 17 years since I’ve seen him. I realized when I saw his obit how you miss someone when its too late to say ‘hey’. RIP Louie and my thoughts to the family. Lou was my neighbor for a few years when I first came to Tiffin and later we shared a few beers at the Oaks. The man was never less then kind to me and a friend. Godspeed Lou until we meet again. Please know that my thoughts and prayers are with your family at this time. May Louie rest in the peace of our Loving God! May each of you also know God’s comfort and peace at this time as well!